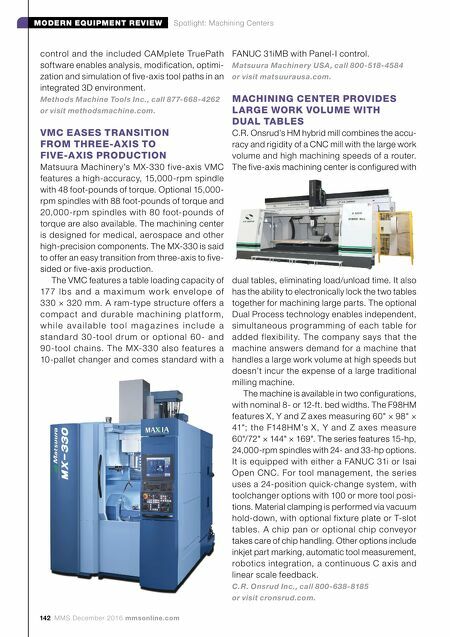 mmsonline.com December 2016 MMS 143 MODERN EQUIPMENT REVIEW Spotlight: Machining Centers When We Say "LIVE TOOLING" We Mean It! 16 E. Piper Lane • Suite 129 • Prospect Heights, IL 60070 847-749-0633 • info@heimatecinc.com • www.heimatecinc.com Preben Hansen, President When We Say "LIVE TOOLING" We Mean It! Heimatec, a name you may not know…but you soon will. Great reputations have a way of spreading. A leading German supplier of live tooling, Heimatec offers a wide assortment of tools for CNC lathes and machining centers, plus the U-TEC ® quick change system, toolholders, multi-spindle drilling heads, specialty tools and more. Application engineering, dealer and end user training from our Chicago headquarters, plus a nationwide network of quality machine tool reps and dealers to serve you. NEW…LITERATURE DOWNLOADS ON LIVE TOOLING FOR BRAND-SPECIFIC MACHINES…OKUMA, MAZAK, HAAS, NAKAMURA AND MORE! COMPACT FIVE-A XIS MACHINE PERFORMS HEAV Y-DUTY TOOLMAKING WORK F. Zimmermann has released its FZ40 Compact, a powerful machine based on the company's FZ33 Compact and of fering the same space-saving dimensions. Its primar y applications include efficient machining of steel, cast iron and titanium. Like the FZ33 Compact, it has a rigid monoblock structure that allows it to be set up easily and rapidly. The new FZ40 Compact is targeted to those who do heav y-duty cutting and want to focus more on toolmaking. 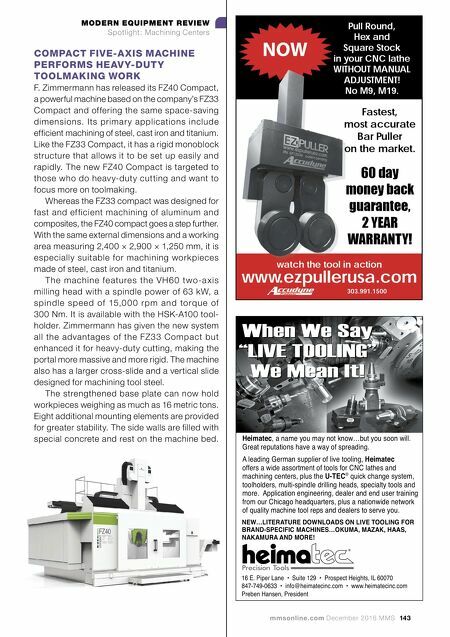 Whereas the FZ33 compact was designed for fast and ef ficient machining of aluminum and composites, the FZ40 compact goes a step further. With the same external dimensions and a working area measuring 2,400 × 2,900 × 1,250 mm, it is especially suitable for machining workpieces made of steel, cast iron and titanium. T he machine fe ature s the V H 6 0 t wo -a x is milling head with a spindle power of 63 kW, a s p i n d l e s p e e d of 15,0 0 0 r p m a n d to rq u e of 300 Nm. It is available with the HSK-A100 tool- holder. Zimmermann has given the new system all the advantages of the FZ33 Compact but enhanced it for heavy-duty cutting, making the portal more massive and more rigid. The machine also has a larger cross-slide and a vertical slide designed for machining tool steel. The strengthened base plate can now hold workpieces weighing as much as 16 metric tons. Eight additional mounting elements are provided for greater stability. The side walls are filled with special concrete and rest on the machine bed.